This column first appeared in the San Antonio Express-News and on MySA.com on 8-14-2015. When your mother applied for Medicaid benefits (which you likely did on her behalf) you opted to participate in a system that imposes severe restrictions in exchange for its aid. To qualify, your mother had to have very few assets ($2000 or less) excluding the value of her home. The home is exempt because Medicaid knows she needs a place to return if she recovers enough to be discharged from the nursing home. The monthly nursing home bill will eventually consume all of the money she got from selling the house. Notice that Medicaid does not “get half the money”; rather, Medicaid stops paying her bill and the nursing home is paid for their services with her half of the money over time. Eventually, when the balance dips below $2000, she should again apply for Medicaid, and when accepted, Medicaid will again help pay her nursing home bill. 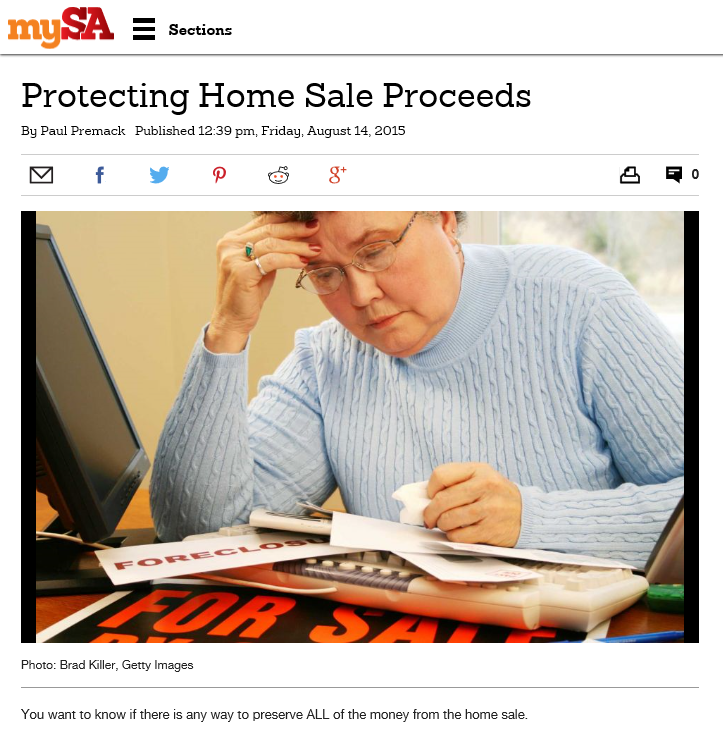 You want to know if there is any way to preserve ALL of the money from the home sale. To do so legally, you would need to qualify for one of Medicaid’s penalty exceptions and then full ownership of the house would need to be transferred into your name before the house is sold. What exception might apply in your case? First, as her daughter, if you are under age 21 or if you have been determined by Social Security to be disabled, the house can be transferred to you without a penalty. If either of these exceptions does apply to you, make an appointment with a Certified Elder Law Attorney. The lawyer can help confirm you qualify for the exception, assist with obtaining the documentation and prepare the transfer deed. You will present it all to Medicaid. Two more issues: First, your mother will need to sign the transfer deed, and if she cannot sign then her Agent under her Durable Power of Attorney will need to sign. The Durable Power of Attorney will need to be written in a way that allows the Agent to make gifts on your mother’s behalf. If your mother is well enough to sign the deed herself, she should also consult with the Elder Law Attorney to be sure her overall estate planning is current and valid. Second, the transfer is a gift. She will need to file a gift tax return with the IRS, but if she uses her lifetime gift tax exemption she will not actually pay a gift tax on the transfer. ← Can Power of Attorney be used for an Equity Loan? Is this applicable only in TX? Although Medicaid is a federal program, it is administered with slightly different implementations by each state. These are the Texas rules; any other state may have variations that would result in different outcomes. Anyone outside of Texas should consult with a Certified Elder Law Attorney in the state in which they will be applying for Medicaid benefits. Mom and Elder Care attorney prepared a Ladybird Trust concerning her home after all assets had been spent down on her care,debts,etc and in prep to get her qualified for Medicaid. Mom recently passed away in nursing home. Mom had a will that involved 2 now deceseased step sons. Stepdad had a Will also that was probated in 2010 leaving everything to my Mom. Mom was mad at Stepfamily when she had Ladybird Trust prepared and designated myself and my sister her living heirs the house. Delivered Trust Document and Death Certificate to said attorney this week. Was told I would be called to sign documents to be filed which included “Affadavit of Death”. I realize this will all be what it will be. My question is: will this affadavit allow for stepgrandchildren, grandchildren of deceased natural child, whoever to become involved in this. Will not to be probated due to Ladybird and MERP. Just want to be prepared. You have an attorney and should be asking this question of your attorney to get a specific individual answer. However, in general, an Affidavit referring to the death of the Life Estate holder is appropriate. It will not open the door for the decedent’s other family to interfere.